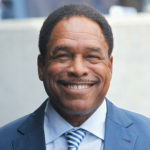 David Winfield is an American former Major League Baseball (MLB) right fielder. He is currently special assistant to the executive director of the Major League Baseball Players Association. Over his 22-year career, he played for six teams: the San Diego Padres, New York Yankees, California Angels, Toronto Blue Jays, Minnesota Twins, and Cleveland Indians. He had the winning hit in the 1992 World Series with the Blue Jays over the Atlanta Braves. "And I found out, the other part of it is that I found out and in my desire to life successfully, that baseball fit very well into my life. It’s been a great teacher, trainer, mentor and you’ll see what I mean in the next few minutes that I have to speak." "Everyone has a breaking point, turning point, stress point, the game is permeated with it. The fans don’t see it because we make it look so efficient. But internally, for a guy to be successful, you have to be like a clock spring, wound but not loose at the same time."